Acer TravelMate P645-VG - a new mobile model of laptop from Acer. The laptop is in a pleasant company style Acer, thanks to which easily fits into any environment. Has a small screen size, which is 14 inches, at a resolution of 1920 x 1080 pixels per inch, and the top surface of the screen Matt. Also the laptop and excellent technical data. As built this laptop at an advanced platform from Intel Corporation. 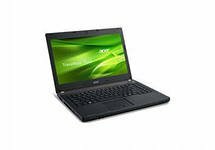 Led by Intel Core i7-4600U, the frequency of which is 2.1 GHz, operative memory of the laptop is 8 GB, also has a solid state drive SSD. This configuration, with a head enough for any application of this laptop.